Today we conclude our four-part analysis of the worldwide widebody freighter fleet. In the first three parts we looked at the composition of the fleet as it stands at the beginning of 2017, and how it has changed over the last twelve months. You can read Part I here, Part II here, and Part III here. Today we look to the future. As we pointed out at the beginning of this series, while the composition of the fleet has changed over time, both the number of freighters, and their combined payload, had been essentially unchanged for the last five years. Looking ahead, we expect that this trend (or non-trend) will continue, and that, while individual freighter aircraft will enter and leave the fleet, the overall size and payload of the fleet is unlikely to change dramatically in the near future. In addition to the active freighters shown in the chart in Part I, there are a large number in storage. This includes many older types that will never fly again, but also includes some fifty 747-400Fs (both production and converted), fifty MD-11Fs, and a few A300-600Fs. Many of these could easily be returned to service if required, but Cargo Facts believes that most of them will stay on the ground. Falling oil prices brought some out of retirement in the last few years, but given the proliferation of belly capacity, the backlog of new freighters that will be delivered over the next few years, and rising oil prices, it would take more than the current 4% annual growth in air freight demand to bring more than a few of them out of the desert. 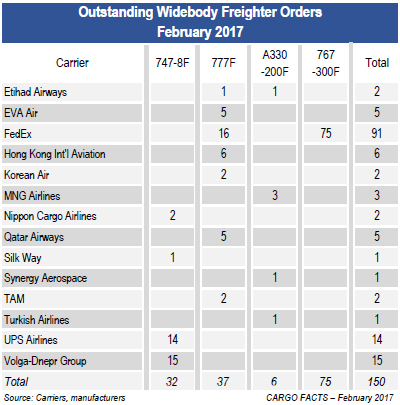 Regarding the backlog, as shown in the chart at right, thirteen carriers and one lessor have 150 widebody production freighters on order with Airbus and Boeing. Of these orders, 60% – sixteen 777Fs and seventy-five 767-300Fs – are for FedEx. The remainder are spread among the other twelve carriers and lessor Hong Kong International Aviation. In addition to the outstanding orders for production freighters, there has been an upsurge in orders for P-to-F conversions in the last two years. SF Airlines, Air Transport Services Group, Atlas Air, and Kalitta Air all have orders in place with Bedek Aviation Group and/or Boeing for 767-300 conversions, while EFW has taken orders for A330-200 and -300 P-to-F conversions from Egyptair and DHL, respectively. The exact number is unclear at this point, but the combined backlog of 767 and A330 P-to-F conversions likely stands at about thirty-five. Add in the 747-400s Bedek is converting from combi to freighter configuration for Asiana, and the total freighter backlog – production and conversion – is between 180 and 190. This is down from last year’s 164 production freighters and thirty-five conversions, but well up from 2015’s 120 production freighters and fourteen conversions. There are currently available programs for P-to-F conversion of 747-400s (Bedek and Boeing), A330-200s/-300s (EFW), 767-300s (Bedek and Boeing), 767-200s (Bedek), and A300-600s (EFW and Turkish Technic). Of these, the 747 programs are effectively dead, and once EFW completes the four A300-600 conversions currently in its backlog, that program, too, is unlikely to see any more orders. Likewise, the days of 767-200 conversions are probably over. But soaring demand for 767-300 conversions means that Bedek and Boeing will have their hands full for the next few years. As for the A330, Airbus launched the conversion program through a joint venture with EFW and ST Aerospace five years ago, but so far has announced only the two-unit order from Egyptair, and the four-unit order from DHL. Cargo Facts expects that demand for freighter converted A330s, particularly the -300, will eventually be strong. And while demand for 767-300 conversions cannot last forever, it will remain strong for at least the next few years. Those interested in freighter conversions should join us at Cargo Facts Asia in Shanghai, 25 – 26 April, where executives from the major conversion houses will participate in a session titled “The Future of Freighter Conversion.” For more information, or to register, go to CargoFactsAsia.com.